Curiosity: A project depicting the exciting and endless possibilities of space exploration. The imagery used in my collage came from several different sources all linked on the WSU creative commons page. These sources include NASA Images, Flickr, and the New York Public Library. I chose these specific images because they all play as a piece in the overall message I portray through the collage. 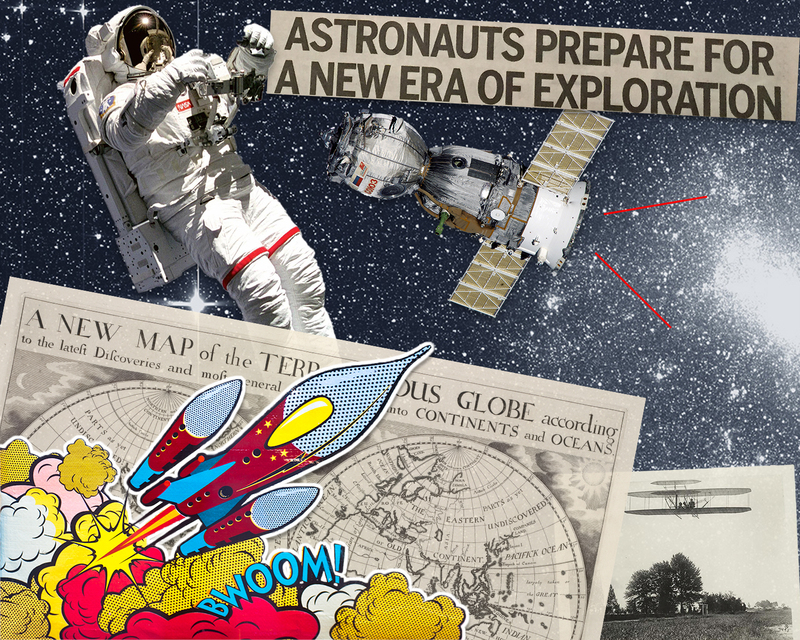 I utilized the old newspaper documents to illustrate how far humanity has come in its exploration of the world. From the discovery of a spherical planet to the invention of flight, a lot of time has elapsed to get to the technologies and discoveries we’re making now. The background image of the stars I chose specifically because it depicts the most recent discovery of a new solar system that we one day hope to explore. I chose the cartoon image of a rocket ship because I wanted to illustrate the excitement and wonder involved with space exploration and ultimately that we are only limited to our imagination. There are a lot of elements embedded in my collage. For starters, the direction of my collage is quite oblique. All of my images are slanted one way or another suggesting chaos and excitement. The value of my project is focused on the white cluster of stars right of the page. the overall gradient of the page goes from a deep blue to a white where there is a possibility for new exploration. There is contrast between the material of my images. The styles of each image help to capture what their presence in the collage means. If anything, I hope when someone looks at my collage they think ‘curiosity.’ There is so much humanity has yet to solve about the universe and space exploration would be a revolutionary step in learning more. I want my collage to speak history as well. There has been a lot of agonizing work and some brilliant minds that have brought us to the technological world we live in today and it is important to acknowledge those efforts. Beyond respect, there is a lot to learn from the patterns of human history. I would love for someone to look at my collage and realize how much opportunity there is in life. To travel to space would be an awing experience all on its own, but being a pioneer of a new solar system is mind-boggling to think about. A few of the main tools I used for this project consisted of the Lasso, Magic Wand, and the Brush. The process began masking off my images so that I could precisely cut out the pieces without losing any of the images. I then took the Magic Wand tool and got a rough cut out of the shape I wanted. Once I had a rough shape I went back around and cleaned up the selection with the Brush tool. Once the selection was complete, I feathered the edges so that the cutouts didn’t look choppy and rather blended into one another. I also adjusted the opacity levels on a few of my layers to allow the viewer to see through to the layers behind one another. I think this technique helped to blend everything together. Without Photoshop, this project would have been difficult to construct. I believe the transparency in my layers plays an important role in bringing the entire piece together. That being said, no, I would not have been able to construct this nondigitally. I was influenced by mainly digital media. The image of the newly discovered solar system I found on NASA’s homepage was a big part of my inspiration to do this project.